Mostly this resort is known as a surfer’s paradise due to the fact that both national and international windsurfing competitions are held here, off the Playa el Cabezo, on the eastern side of the resort. It is here that the ideal warm strong winds and great waves make this such an ideal place for this wonderful sport. Also here in El Medano there is lots of kite-surfing which takes place in South Bay ‘La Bahia’. The beach here is large and sandy and with Montaña Roja projecting into the sea this makes it ideal for ‘launching’, safe in the knowledge that should you end up swimming you will always end up back on the beach which is always a good thing! Another great thing is that Tenerife Kitesurfing Centre is here and so there are lots of opportunities for instruction available either to get you started or to help you to improve, which all makes for an exciting and very sociable holiday. Of course families are not forgotten in El Medano and the super soft sand and shallow water, together with the maximum sunshine make this a safe haven for little ones to play contentedly on the beaches which are truly stunning and totally natural. One of them stretches an amazing 2km which is lovely for those of you who love to stroll up and down to get your sun-kissed look! All in all, El Medano is pretty relaxing when you are not up to your eyes in surfing. It has a wonderful laid-back air which is helped by the many cafes, bars and restaurants which pop up along the promenade and entice you to a cool drink or a leisurely meal while you watch as the rest of the world goes by – just wonderful. Of course when you are ready to, you can jump up and go shopping for perhaps surfing gear, in a variety of specialist shops, or maybe chic clothes shopping if you would prefer, or maybe just browse here and there . There is also the market of course and El Medano has one of the best markets which is held on Saturday mornings in the plaza. 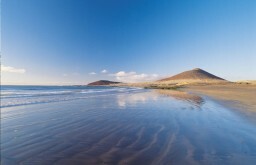 Last but not least, is the fact that El Medano has the perfect spot for nudist sunbathing at Playa de la Pelada. It is at the eastern end of the resort and very sheltered particularly as the many large rocks on this lovely part of the island give just the right amount of privacy.